Skipper Marc Richards is confident the Cobblers’ trip to Spain is going to lay the foundations for a successful season ahead. The Town squad are midway through their week-long training camp at Oliva Nova, and Richards says everything has gone perfectly so far. 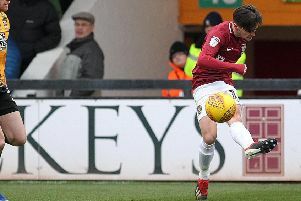 The Cobblers are spending the week doing double training sessions, first early in the morning and then in the evening, before taking on Birmingham City Under-23s in a friendly on Friday night. The week is also a great chance for the new players signed over the summer to integrate themselves into the squad, and the skipper says things have gone very smoothly. “It has all been really good, really positive,” said Richards. “From a players’ point of view this is exactly what you need really at the start of a pre-season. “There are new faces coming in the door, and to try and break down those barriers and try to get to know each other, living in each other’s pockets for a week does us the world of good. There are new faces coming in the door, and to try and break down those barriers and try to get to know each other, living in each other’s pockets for a week does us the world of good. “Certainly, for a club that is looking to move forward, it is building foundations and this is a week that will stand us in good stead for the rest of the season. “Pre-season is what it is, and it can come very repetitive at times, just being stuck at Moulton for six or seven weeks prior to the season starting can really drag out. And what about the Oliva Nova facilities? “The complex we are using here is first class,” said the Town skipper. “The training pitches we are working on daily are as good as Sixfields, and that’s all we can ask for, to have good facilities. There are nine new signings in the Town squad, and Richards has been impressed by the input on and off the pitch from new boys, saying: “All of the lads that have come in have been golden, they are great characters. “Dean Bowditch’s initiation song went down an absolute treat, and I am sure everybody that has seen Billy Waters’ song will know that he’s got a thing for music!